When strong-willed Minna rescues an abandoned foal, she does not realise that he will become the pride of the Roman cavalry, nor the part they will play when her town is threatened by bloodthirsty pirates. Minna risks all as she sets out on a perilous journey to save her people. A gripping tale of passion, courage and adventure set in the vibrant historical setting of Roman England. Minna is just a blacksmith's daughter, yet she succeeds in raising a sickly abandoned foal, turning him into the pride of the Roman cavalry. Her stubborn determination and fiery nature burn brightly in the quiet fort of Othona and soon attract the secret admiration of the proud commander, Theo. A delight to read... I know for sure that my adolescent self would have loved this book... There is suspense and excitement of the kind that made me read the book in one sitting. "This book shows courage, inspiration and determination." Romantic and beautiful. It's brilliant. One of the best books I have ever read. K. M. Peyton is a prolific writer of pony stories and this is a pony story for a mature teenage girl - with the difference that is set in Roman times. ... This book gives a good picture of Roman Britain in the last days of the Roman Empire. The set-up of the Roman fort with the native village just outside is clearly explained. The opulence of Camuloden is contrasted with the simplicity of Othona. But the love of Minna for Silva and of Cerdic for his dog will mean that this book has a special meaning for animal lovers. Comes with a glossary and a map. For animal-loving teenage girls. 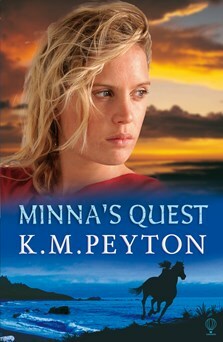 If I am completely honest I was fairly sceptical when I first picked up Minna’s Quest, the first book in a new series written by KM Peyton (famous for award winning ‘Flambards’). It seemed to revolve around horses - a creature that makes my eyes itchy and my skin red and lumpy. However, having enjoyed ‘Flambards’ I gave it a go - and I am very glad I did. Set in Roman times, ‘Minna’s Quest’ is a gentle but fast-paced story about a 14-year-old girl, something which I could relate to, who finds an abandoned and sick foal. Nursing it back to health, Minna’s foal soon grows into a beautiful and strong pony. But Minna’s village is under invasion from blood thristy pirates. Can Minna and her pony Silva save their fort? The blurb to this book sounds a little dull, but give it a chance, you won’t be disappointed! I can’t wait to read the next book. I’d recommend this to girls aged 10 - 16 years, for a fun read.